If you are looking for large group accommodation in Scotland, Stationmaster's Lodge could be the perfect place for you! Stationmaster’s Lodge is a grand stone built highland house with stunning lochside views of Loch Carron. Ideal for groups, our self-catering accommodation sleeps up to 18 in comfort and is a great base for exploring Scotland's west coast, Plockton and Isle of Skye. Dogs welcome. From only £325 per night for the whole house in low season and £450 per night in High Summer. Please note we have a minimum booking policy of 3 nights Sept to May and 5 nights in June, July & Aug.
To see our festive season prices, please click below. Rent your own Highland Lodge! Located in the wee highland village of Stromeferry (no ferry! 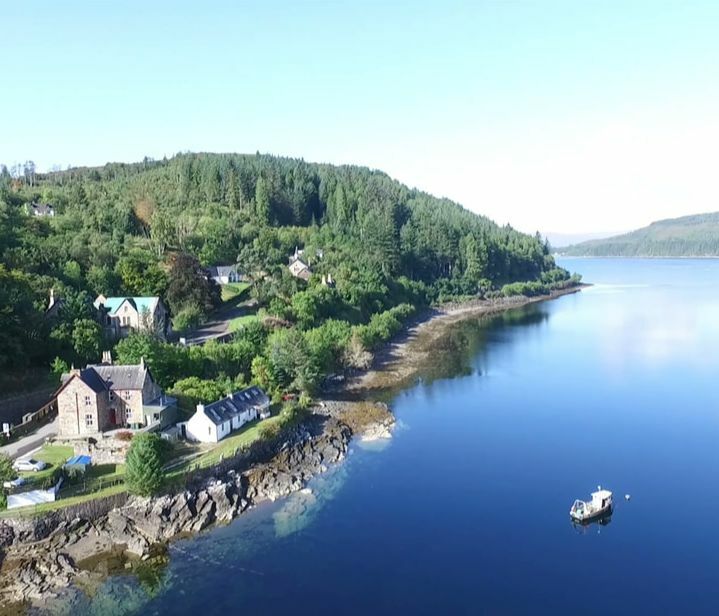 ), amongst spectacular west coast scenery and overlooking Loch Carron, Stationmaster’s Lodge is ideal self-catering holiday accommodation for large groups, family gatherings and groups of friends, with stunning loch views, plenty of space and great facilities including a cosy wood burning stove. DOGS WELCOME! ​This large holiday home, perfect for group accommodation, is packed full of character and history spread over three levels. There are eight bedrooms, half of them en-suite. The rooms are a good size and some of them have incredible loch views. Look out for otters on the shore! Read the Review on Cool Cottages Scotland. The open plan lounge is great place to relax with comfy sofas, a roaring log-burner, huge dining table sits 17, which converts into a pool table & table tennis and amazing lochside views. ​This lodge truly is the ideal place if you are looking for large group accommodation in Scotland. There is a large brand new kitchen with oven and hob, microwave, and plenty of cooking equipment for a big group meal. The house is really cosy as its heated by a state of the art biomass boiler with wood pellets. Free WIFI throughout means you can stay in touch, despite the remote setting. Enjoy the ever changing views down Loch Carron. Outside is a lochside terrace area with tables and chairs, and BBQ. Facing the loch, it’s a great place to enjoy breakfast or dinner in the summer months. Look out for our local otters and stunning west coast sunsets!